Today’s Timeless Tuesday challenge hostess is Silke. She created a great sketch for us. 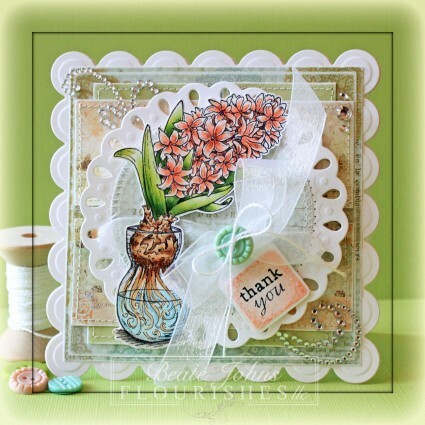 For my sample I pulled out the Hyacinth Hello stamp set. I hadn’t used the image with the flower in the vase yet and thought it was perfect for this time of the year (with a bit of wishful thinking…). The image was stamped in Tuxedo Black Memento Ink on Neenah Solar White cardstock. It was colored with Copic Markers ( Petals: Rooo, R00, R01, R02, T2, T3 Leaves: G20, YG01, G21, YG63 Bulb: E30, E31, E33 Water: B41, B0000) and cut out. A piece of Pink Paislee Butterfly Garden paper was cut and embossed with a Standard Circle Nestabilities die. The edges were sanded and the circle was stitched to a piece of white cardstock, cut and embossed with the largest Tear Drop Circle Nestabilities die. Another piece of Pink Paislee paper was cut and embossed with the second smallest Grand Square Nestabilities die. The edges were sanded and adhered to a piece of white cardstock, cut and embossed with the second smallest Grand Scallop Square Nestabilities die. The edges of two 1 3/4″ x 4″ strips of green patterned paper of the same paper pack were sanded, then stitched, then adhered to the square layers vertically. Two more strips were cut, sanded and stitched and adhered over the layers horizontally. Organdy Ribbon was tied through the Tear Drop pieces before the image layers were adhered to the card base with dimensionals. A sentiment from the Hyacinth Hello in Tuxedo Black ink on a piece of white cardstock, cut and embossed with the retired 5 in 1 Tag die. The inner part of the tag was colored with Copic Markers (R000, R00, R01, R02) and tiny Stardust Stickles dots were added. The tag was tied to the bow with embroidery thread. The same thread tied an October Afternoon button over the bow. More Stardust Stickles was added to the center of the flower petals. Parts of a Finesse Rhinestone Swirl were adhered to the top left and button right corners and additional Rhinestones on the upper left hand side finish off the card. Hi all and welcome to the final day of Flourishes’ Release Week! On to today’s special treat! This next set is just that — a sweet treat for those you love! Want to see what I mean?? Love, Sweet Love offers a sweet way to honor your Valentine! From a cookie bouquet to a beautiful box of chocolates, to a basket of flowers complete with a darling, heart-adorned love note, this set illustrated by Marcella Hawley is sure to warm your heart. This 4 by 6″ set even comes with 3 beautifully scripted sentiments to tell your love how you feel! The Flourishes DT has been busy at work trying to sweeten up some Valentine creations with this set! For my sample today I used the basket image from Love, Sweet Love. It was stamped in Tuxedo Black Memento Ink on Neenah Solar White cardstock and cut and embossed with a Standard Circle Nestabilities die. The image was colored with Copic Markers (Letter: E40, E442, R08, R29, R39, Lipstick Spica pen Tulips: Y13, Y15, Y18, YR15 , YG11, YG13, YG17 Lavendar: RV63, RV55, RV66 Basket: E42, E43, E44, E47 Ground: W3, W5, W7, W10 Sky: B0000, B000) and adhered to a Paper Doily. A 1 3/4″ x 5″ strip of Echo Park Springtime Paper was adhered to a 5″ square of the same paper pack. The paper was cut and embossed with a Grand Circle Nestabilities die and stitched to a slightly bigger, hand-cut white cardstock circle. White Organdy Ribbon was colored with Copic Marker RV55 and tied around the vertical strip. The bow was topped with a white button, tied on with silver curling ribbon. The image layers were adhered over the layers with dimensionals. A sentiment from the new set was stamped in Tuxedo Black Memento Ink on a piece of white cardstock that had been cut and embossed with the smallest Petite Oval Nestabilities die. The embossed part was colored with Copic Marker B0000. The sentiment was adhered to the upper left of the image. Rhinestones were added underneath the sentiment and part of a Finesse Rhinestone swirl above the bow. 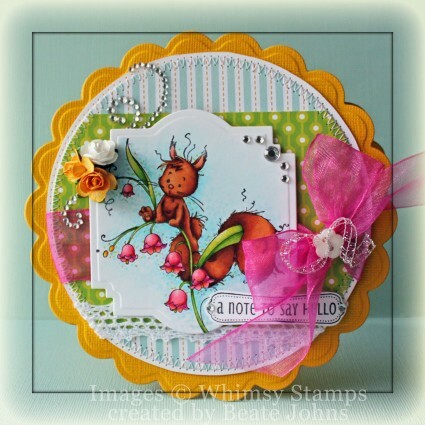 The layers were adhered to the card base, Kraft cardstock cut and embossed with a Grand Scalloped Circle Nestabilities die. Would you like to win the Love, Sweet Love set? All you need to do is leave some love in the form of a comment on the blogs below! Why? You need to try to figure out…..
One of the ladies on our link list below will be picking a name from the comments on her blog post today. We don’t know which one it is… so the more blogs you leave comments on, the more chances you have to win! DID YOU KNOW YOU COULD WIN OUR ENTIRE JANUARY RELEASE? Have you checked out our New Year Challenge? Just click HERE to find out how to play! You can also play in our Noon Time Challenges! 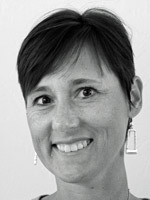 Check out yesterday’s noon time challenge – The Year of the Dragon Challenge. Or, how about the 2-0-1-2 Challenge HERE? All challenges will close this Friday at 5 PM EST and winners will be announced Saturday in our Winner’s Circle blog post! So get those fingers inky and good luck! Hello and welcome to Day two of our December Rubber Die Release Showcase! 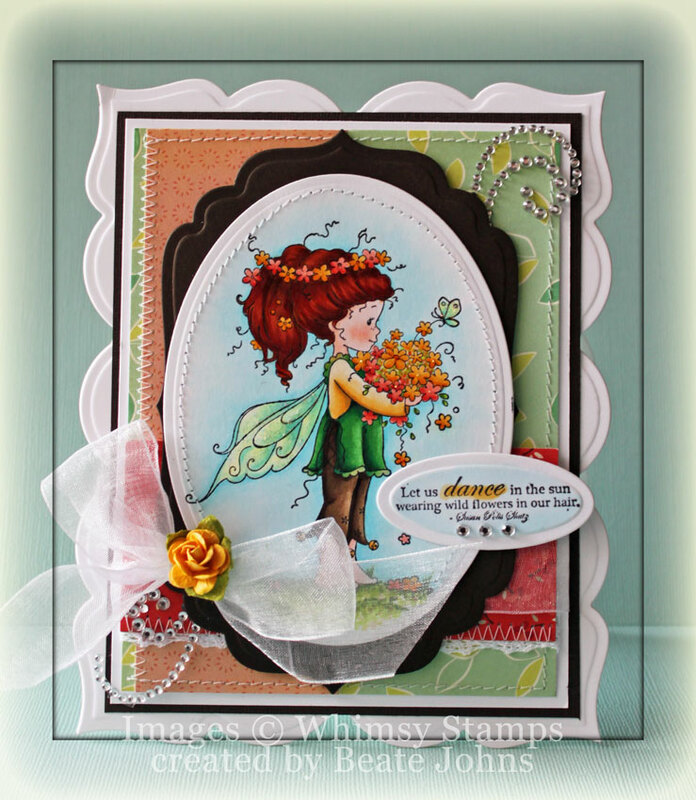 For my first sample of this new release I used the darling Fluffy on the Lily stamp from Wee stamps. It was stamped in Tuxedo Black Memento Ink on Neenah Solar White cardstock. The image was cut and embossed with a Label 22 Nestabilities die and colored with Copic Markers (Fluffy: E93, E95, E97, E99 Leaves: YG21, YG23, YG17 Flowers: RV21, RV23, RV25, Y13, Y17, YR15 Background: B0000, B000, B00, B01). Two pieces of Echo Parks Summer Days paper were cut and embossed with a Grand Circle Nestabilities. The layers were stitched to a slightly larger hand cut white cardstock circle after White Crochet Lace was adhered over the lower edge of the horizontal strip. White Organdy ribbon was colored with Copic Marker RV25, tied around the horizontal layer and topped with a white flower button, tied on with Silver Curling ribbon. Three Zva Creative Mini Flowers were tied together and adhered under the upper left hand corner of the image layer, which was then adhered over the ribbon with dimensionals. A sentiment from Whimsy’s new Friendship Notables 2 was stamped in Tuxedo Black Memento Ink on Solar White cardstock cut out and adhered to the lower right edge of the image. 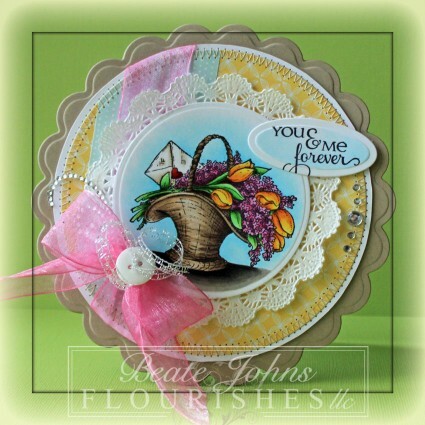 The layers were adhered to the card base, a piece of Coredinations cardstock, cut and embossed with a Grand Scalloped Circle die. Rhinestones and part of a Finesse Rhinestone swirl finish off the card.